Addis Ababa, July 1, 2017 (FBC) – The new director general of the World Health Organization (WHO), Dr Tedros Adhanom, took over managing the UN health agency on Saturday, the WHO said. A specialist in malaria, Tedros served as health minister and later as foreign minister for Ethiopia. The 52-year-old is the first African to head the global health organization and he takes over from Margaret Chan of China, who led the WHO for nearly 10 years. Dr Tedros was elected to the post in May in what was the first time the WHO director-general was chosen by the World Health Assembly from among multiple candidates. Previously a single nominee had been chosen by the executive board. The Geneva-based WHO, with some 8,000 employees worldwide, is responsible for coordinating global action to disease outbreaks and epidemics, such as Ebola, and to set the norms for health systems in all countries. 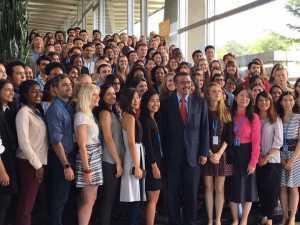 After his election as head of the Geneva-based U.N. agency, Dr Tedros said achieving universal health coverage would be a top priority during his five-year term. “Globally an estimated 400 million, approximately 1 in 17 people, lack access to essential health services, that’s unacceptable,” he noted. Dr Tedros was elected Director-General of WHO last May. He has served as health minister and foreign affairs minister of Ethiopia. As Ethiopia’s health minister between 2005 and 2012, he hugely expanded healthcare in his country. He created 3,500 health centers, while dramatically expanding the healthcare workforce. He built more medical schools and deployed nearly 40,000 community-based health workers across the country. Dr Tedros’s efforts to improve Ethiopia’s health system were crucial to doubling the percentage of Ethiopian women with access to contraception. His efforts saw a reduction in maternal mortality of a staggering 75%. As Ethiopia’s foreign minister Dr Tedros went on to lead negotiations for the Addis Ababa action agenda, an international plan to finance the United Nations sustainable development goals. He has unmatched experience in successfully leading global health institutions. He was chair of the Global Fund to Fight Aids, Tuberculosis and Malaria between 2009 and 2011. He chaired the Roll Back Malaria Partnership from 2007 until 2009. Dr Tedros pushed through sweeping changes that dramatically improved both organizations.